After 10 years of steady progress by countries, the latest iteration of the International Budget Partnership’s flagship publication, the Open Budget Survey (OBS), recorded a modest decline in average global budget transparency scores. The survey finds that roughly three-quarters of the countries assessed do not publish sufficient budget information (a score of 61 or higher). Launched in 2006, the Open Budget Survey is the world’s only independent, comparative assessment of the three pillars of public budget accountability: transparency, oversight and public participation, in countries around the world. The sixth round of this biennial assessment, the 2017 survey evaluated 115 countries across six continents. 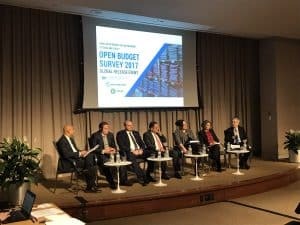 On 31 January 2018, IBP cohosted a global release event with the World Bank and Oxfam in Washington, D.C., to discuss key findings of the Open Budget Survey 2017, and how governments, civil society, and other stakeholders can use the information offered in the report to improve transparency practices in their countries. Opening remarks were delivered by Jan Walliser, Vice President of Equitable Growth, Finance, and Institutions of the World Bank, who spoke determinately of the necessity for governments to engage citizens and civil society to identify where public resources are needed the most. Vivek Ramkumar, IBP’s Senior Director of Policy, presented the results of the Open Budget Survey 2017, stating that amid declining public trust in government and increasing inequality, progress toward global budget transparency has stalled for the first time in a decade. Major gaps in overall levels of budget information persist, and countries offer few opportunities for citizen participation in the government. In its assessment of the role of formal oversight, the Open Budget Survey 2017 finds that the legislatures of only 28 percent of countries have adequate oversight practices. In contrast, the supreme audit institutions in 65 percent of the countries surveyed had the ability to provide adequate oversight. Though the findings of the OBS 2017 may seem discouraging, several countries achieved major improvements to their scores: Georgia, Senegal, Jordan, and Mexico. Ramkumar noted that the success of these diverse country cases confirms that any government that has political will can achieve its desired levels of budget transparency. How Can We Bridge the Gap Between Citizens and State? H.E. Mamuka Bakhtadze, Minister of Finance of Georgia, emphasized the importance of high-performing countries to not become complacent with their results. Achieving sufficient levels of budget transparency is one matter – sustaining the results as country contexts and governments change is another. Minister Bakhtadze spoke of how championing transparency and accountability is vital to achieving effective, inclusive growth, a priority for many emerging economies. The Minister of Finance of Afghanistan, H.E. Eklil Ahmad Hakimi, spoke of the challenges in institutionalizing gains made in budget transparency, suggesting countries rely on their own resources, along with partnerships with donors, civil society, and other stakeholders to ensure budget transparency remains the practice for future governments. Undersecretary of Expenses in Mexico Fernando Galindo Favela also offered some insight here, underscoring three conditions to maintain fiscal transparency gains: 1) legal framework to ensure openness; 2) clear targets for the Open Budget Survey; and, 3) a frank and sustained dialogue with civil society. A key topic of discussion focused on the myriad of options governments can take advantage of to improve their transparency and accountability practices. Undersecretary Favela cited Mexico’s budget portal as an example in how to make budget information easily accessible to citizens. Several panelists discussed the importance of robust partnerships between government, civil society, media, and other actors. 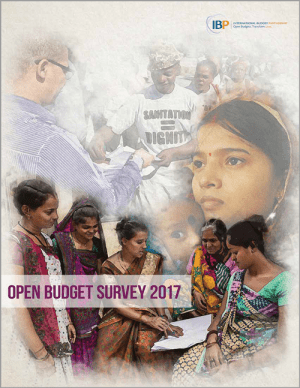 The Open Budget Survey’s country summaries detail recommendations for governments looking to improve their OBS score: often, it is as simple as publishing budget documents online in a timely manner. All in all, governments have many opportunities to improve their practices, and doing so allows for a more productive relationship between governments and the people they serve.